This eLearning course is the first of its kind and provides a solution to educate employees responsible for hiring on the role they play in maintaining in compliance. For over 30 years Berkshire Associates has successfully helped federal contractors comply with AA/EEO regulatory requirements. Through this experience, Berkshire recognized talent acquisition can leave a company open and vulnerable to OFCCP audit challenges, discriminatory practices, and even lawsuits and claims. 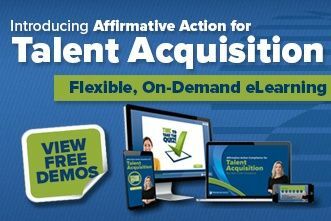 Affirmative Action Compliance for Talent Acquisition eLearning course was designed to address these issues, and act as one preventative measure against unlawful hiring actions. Berkshire recommends federal contractors incorporate this course into their ongoing compliance initiatives. At only $99 per seat, it is an inexpensive solution to reducing the risk of costly hiring mistakes. Companies can purchase multiple seats for company-wide training, or individuals can purchase single seats for an individual learner. You can click here to view a demo of the course, and contact us at 800.882.8904 or bai@berkshireassociates.com for more information about this product.